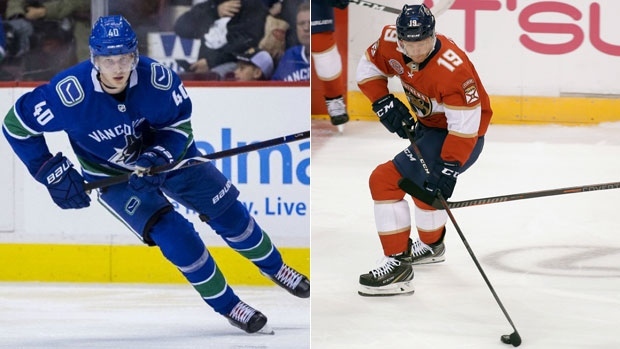 Florida Panthers defenceman Mike Matheson will have a hearing with the NHL Department of Player Safety on Monday for interference/unsportsmanlike conduct on Vancouver Canucks star rookie Elias Pettersson. TSN Hockey Insider Darren Dreger reports the hearing will be held over the phone. Pettersson left Saturday's 3-2 win against the Florida Panthers in the third period with an injury and did not return. The 19-year-old was taken hard into the end boards, then slammed to the ice by Matheson and needed assistance from the trainers to the locker-room. There was no immediate update from the team on his status, but head coach Travis Green said it was the type of play the NHL needs to get rid of. "That's a dirty play. The league's trying to protect the good, young players and that's just a dirty play," said Green. Matheson wasn't penalized on the play, nor was he held accountable by any of Pettersson's teammates with the game tied 2-2 at the time of the injury. Horvat scored the go-ahead goal for Vancouver less than two minutes later, and Green felt holding on for the two points was of more value. "We won the game, I'm not going to comment on retribution," said Green. Saturday started off promising for Pettersson. The red-hot rookie scored his fifth goal and eighth point in his fifth game of the season in the second, matching Vancouver's record for the longest point streak to begin a career in a Canucks uniform. Don Tannahill was the first to pick up at least a point in his first five games with Vancouver in 1972-73.